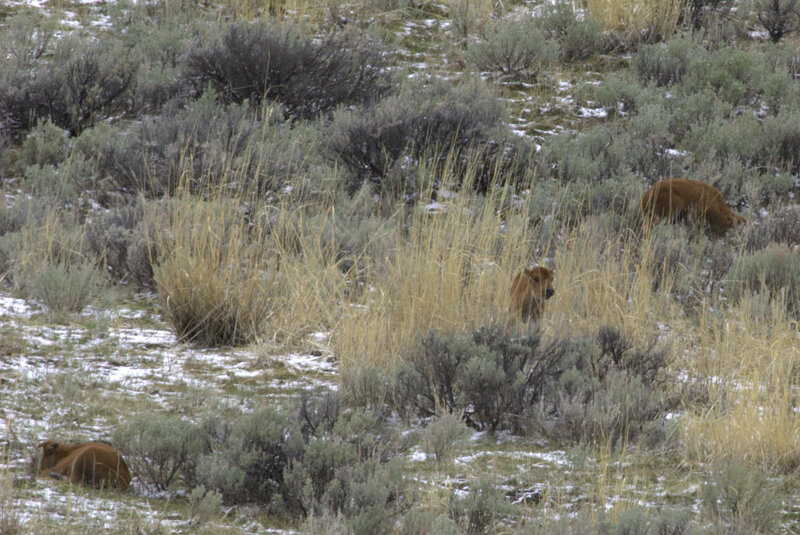 W&L Biology in Yellowstone: First day in the park. We made it out of the Bear Lair lodge by 11:30 this AM. Went to see the Gardiner Basin exclosures and then up to the Yellowstone Center for Resources to pick up the research permit. Checked out the Albright visitors center and then headed out towards the Lamar Valley. It's cold (from 26-42 depending on elevation) and cloudy with occasional breaks in the clouds to let the sunshine and blue sky show through. Near Specimen Ridge we spotted these bison calves. This was taken with a 400mm telephoto lens. Will got 3 calves in one shot. Getting ready to unpack the boxes and set up the lab. Then decide on dinner and make a plan for tomorrow.